Executive Chef Manik Magotra and his team are known for their authentic presentations of classic dishes as well as innovative creations with a twist. 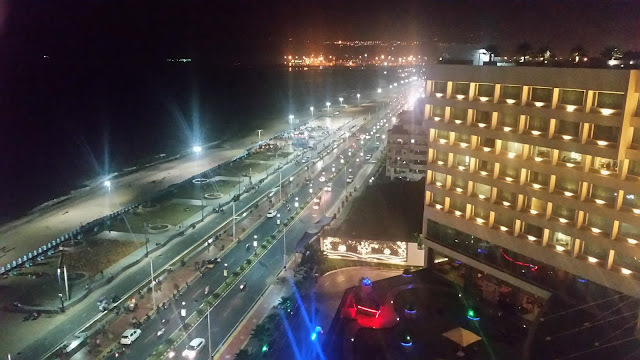 So, our expectations from any preview at The Trident is always sky high. I was really looking forward to the preview of the new menu at Tuscany. The Chef had worked out a set menu for the preview, consisting of highlights of the new offerings. I always prefer a compact menu for any food tasting and shudder at the thought of trying out a humongous number of items. Thankfully this is never the case at The Trident. The first appetizer served was Aubergine Stack, batter fried fritters of eggplant with layers of mozzarella, and served with cherry tomatoes and saffron cream. 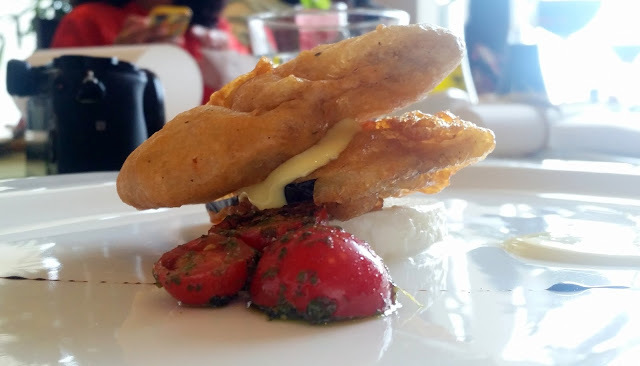 Eggplant fritters are popular in many parts of the world, including my native Eastern India, but the idea of serving it with cheese and cream was novel, and I was surprised to find out that the combo works pretty well. Got an idea of doing some experimentations at home around the Bengali version of it (Beguni) and cheese. 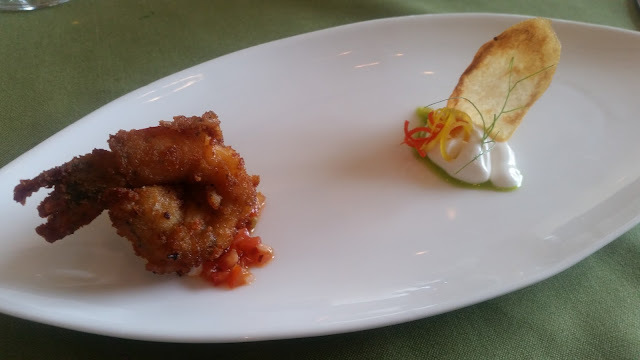 The other appetizer was Gamberi Fritti which had batter fried prawns served with potato chips and garlic cream. The prawns were just done the right amount, and the garlic cream was top class. I was happy to see Wild Mushroom Cappuccino being served again. I had tried this mushroom-based zuppa with espresso foam at an earlier Fungi Fiesta Festival at Tuscany, and really liked the rustic taste of the mushroom followed by a lasting aftertaste of espresso. Today it was as good. 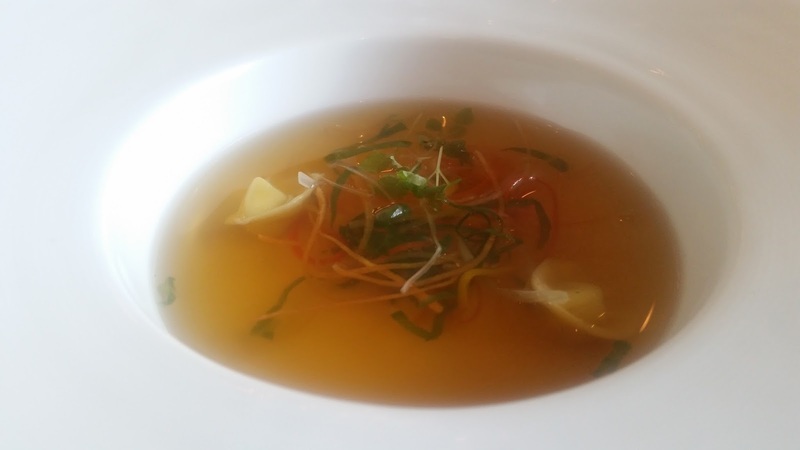 The other soup on offer was a mild Consomme with Chicken tortellini and Vegetables. I tried a spoonful from the diner sitting next to me and found the clear soup extremely flavourful. 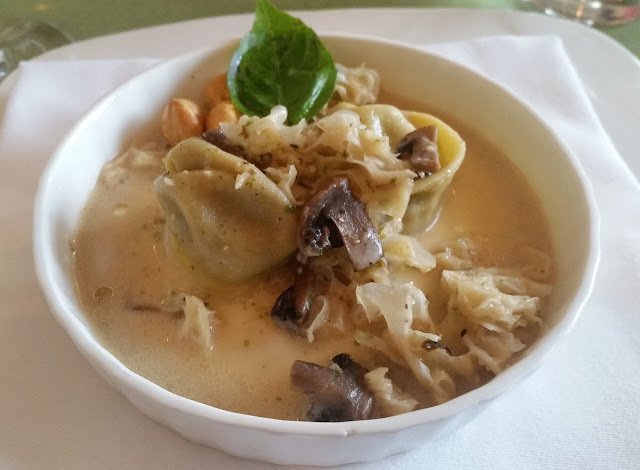 In the main courses, my favourite was Wild Mushroom and Goat Cheese Tortellini. The porcini cream based sauce in which it was served was simply brilliant. The pasta, mushroom and cheese combo was a complete treat to the taste buds. Easily the dish of the day. 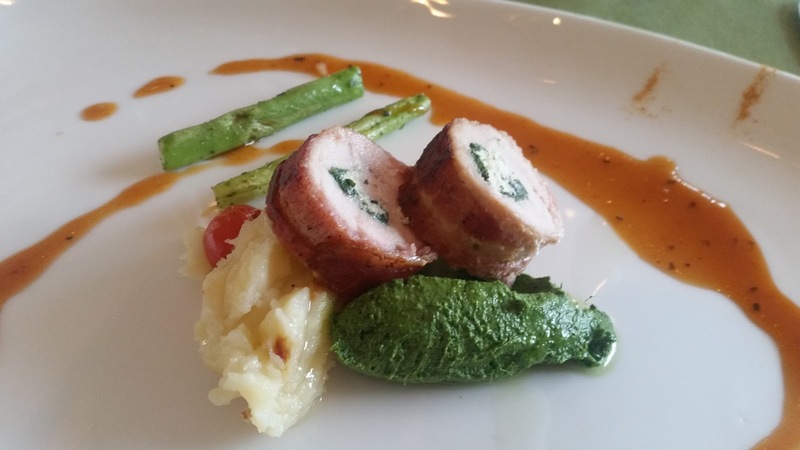 Bacon Wrapped Chicken was served with cherry tomatoes, and mashed potatoes and green bean paste. It was a tad too dry in my opinion. If we rate the looks of the dishes, Beetroot Risotto will surely get the top slot. 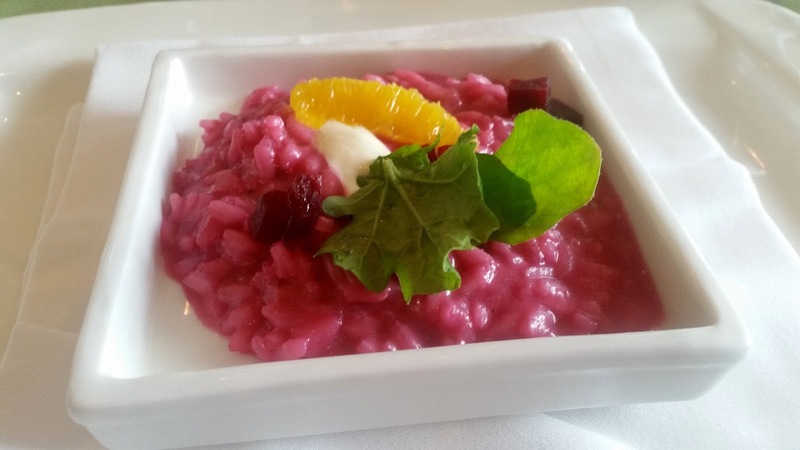 The pink coloured risotto was served with fresh orange, arugula and goat cheese, and looked extremely appetizing. I am not a big fan of risotto, but this cheese-laden dish was prepared so well that I ended up having the whole plate. In the dessert section, the choices were kept simple. 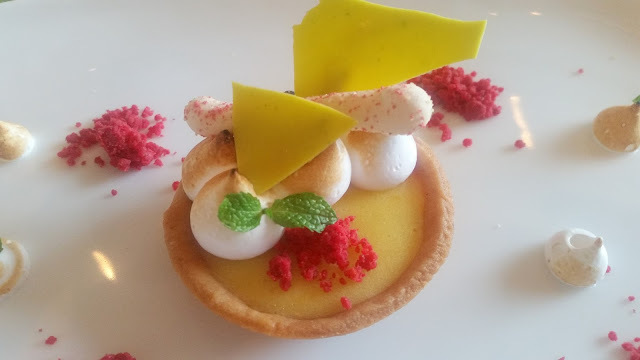 The Lemon Tart was brilliantly served with burnt meringue and raspberry macaroons. Whenever a lemon tart is served anywhere, a discussion on “Oops I dropped the Lemon Tart” comes up, and today was no exception. Gelati infused with Macerated Fruits was the one which was a bigger hit with me. 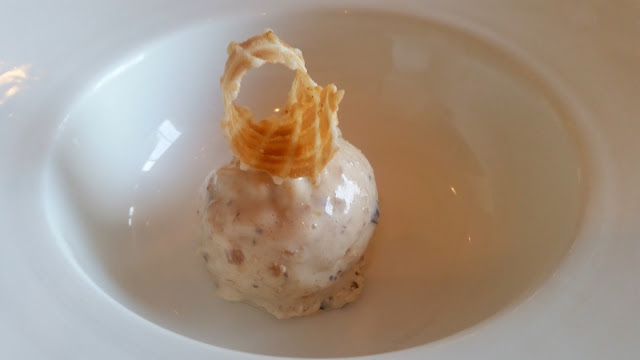 The spirits softened fruits gave a different dimension to the ice cream, and the preparation provided a soothing end to the meal. A detailed look at the new menu unveiled some more interesting dishes. Balsamic and Honey Glazed Pork Belly, Lobster Bisque, and uncommon pasta like Pyramidoli looked interesting to be savoured on another visit. Existing guests will definitely find this fairly comprehensive makeover of the menu a very welcome event. 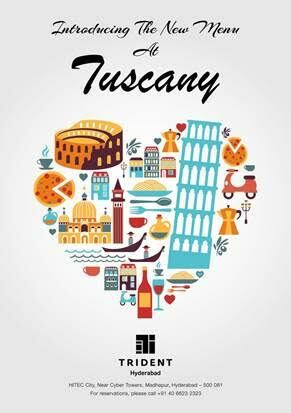 Tuscany remains a top-notch destination for Italian food in Hyderabad, and it is good to see them doing that little bit extra to delight their clientele.